The pending multifaceted, two staged deal on raising the debt ceiling has received mixed reaction. Those on the left despise the fact that the deal does not include any immediate tax increases, or as they have been defined in this debate, revue increases. Those on the right despise the deal because it does not contain any significant reforms on entitlements and does no go far enough in proposing cuts. Then there are those who have no partisan political allegiances. These are for the most part, the average independent, middle of the road voter. These individuals understand that the proposal’s almost $3 trillion in deficit reduction over a ten year period is really only a drop in the bucket that does little to put a dent into our long term debt and is still not enough to maintain the United States’ AAA credit rating. While the deal is not yet a done deal, despite conservative angst with the proposal and liberal disgust for the bill, it is more than likely going to pass in the Senate. So ultimately, look for passage of the bill. That brings up another debate. One that is totally based on political perceptions and asks who won this deficit ceiling debate? Seeing as how the bill raises our debt ceiling and does not reduce our debt significantly enough, there are no winners. At least not immediately. In fact the lack of immediate results makes us all losers here. But at the same time, it is clear that Republicans have settled on a deal that moves things in their direction. Democrats received none of the tax increases they wanted, they received none of the spending increases they wanted, and they were forced to accept some bitter pills. Some of these pills include the Republicans desire to get Democrats on record with a future vote on a balanced budget amendment and immediate spending caps. Another Republican victory in the proposal that is hard for the left to swallow is the automatic wholesale cut of up to $1.2 trillion that will occur if several terms of this bill are not met by the time Congress goes on their Thanksgiving recess in October. 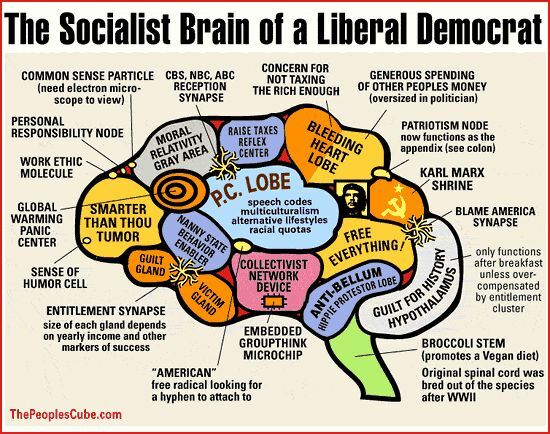 So it would seem that Republicans have advanced their conservative agenda far more than liberals advanced their socialist agenda. Still, the need to reduce the deficit significantly enough to insure that our debt does not continue to exceed our GDP, has not been achieved. Solving that problem will require deficit reduction actions that more than double the nearly $3 trillion proposed over the next decade. And that will have to be done in the not so distant future. In the meantime, while Republicans did not have to compromise as much as Democrats were forced to, they are not yet winners in the debate. That will only be determined in October when the newly created Select Committee on Deficit Reduction proposes the $1.2 trillion in cuts and expense saving reforms that the bill demands. From the Republican perspective, the danger here is that this super committee is not limited to spending cuts and entitlement reforms. It could end up proposing tax increases (revenues). The committee could also shirk its responsibility to significantly reform entitlements, something that will be quite hard to pass the Senate anyway. Given the flexibility that the Select Committee on Deficit Reduction has, the only way the G.O.P. will have proven that they were successful in this recent deficit ceiling debate will come from what the Select Committee on deficit Reduction comes up with. The committee is to be comprised of 6 Democrats and 6 Republicans, presumable chosen by the legislative leaders of the perspective political Parties. Boehner and McConnell for Republicans, and President Obama, Harry Reid, and Nancy Pelosi for the Democrats. 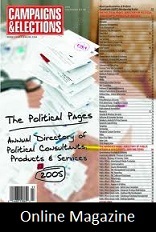 The Party leaders will initially consider the usual cast of characters as candidates for this committee. People like Tom Kean, Erskine Bowles, Alan Simpson, Lee Hamilton, Judd Gregg, and other seemingly, now non-partisan, elder statesmen. Now while there may not necessarily be anything wrong with the usual cast of candidates for typical D.C., bureaucratic committees, the crisis we are in is not typical. Our debt crisis is so severe that for the first time in history, military experts warn that it has become a national security crisis. Furthermore; President Obama’s leadership has awakened the nation to just how distinct the political ideologies that divide our nation are. People have come to question what kind of nation America will be. Will we be the type of nation with a government that controls more and more of our lives with greater control, or do we want less spending, less government, and more freedom. Including economic freedom. The ideological differences have become so divergent, that it is incumbent on the G.O.P. to make sure that the 6 members they choose for the deficit reduction commission are true conservatives who believe in limited government. Any one of those who doesn’t hold true to that belief, can easily defect and give the balance of power to the 6 liberals that Democrats will appoint to that committee. So who should the G.O.P. appoint to the committee? The first choice should be House Budget Committee Chairman Paul Ryan. Ryan is a must. He is a deficit hawk who is reasonable but passionate. He understands the need for entitlement reform, supports a balanced budget amendment, is brave enough to stand against the tide of popular opinion and not looking for anything more than getting the job done. Another appointment should be Indiana Governor Mitch Daniels. Daniels has been there and done that when it comes to the budget, deficits, and spending. As Governor, his state has been one of the most economically stable states in the nation and he brings to the table some first hand experience with the excellent built-in, economic structural aspects of the budget process that Indiana has and that the United States would be wise to adopt. Former Tennessee Fred Thompson is another excellent choice. Thompson has proven to have a wealth of understanding for our existing problems and a unique down-to-earth and often blunt approach to the problem that can be refreshing. Other good choices would be individuals who do not come from the often self-contained alternative reality that is Washington, D.C. People who are students of sound economic policy and people who have operated with and successfully crafted budgets that created jobs. The type of people who come from the real world……the private sector. People like Jack Welch, the most studied CEO of the 20th century, who had a successful 41- year career with the General Electric Company, one of the nation’s most preeminent names in the free market. Lawrence Kudlow is another refreshing suggestion. The CEO of Kudlow & Co., LLC, an economic research firm was a chief economist and senior managing director of Bear Stearns & Company, back when Bear Sterns ran things right, he improper workings of the Federal Reserve Bank regarding open market operations and bank supervision. Kudlow is also the host of The Kudlow Report on CNBC. With the exception of Paul Ryan, there are probably others who would make even better members than those suggested above. These are the type of people who should have a seat at the table that represents the conservative, free market, economic principles which can get us back on track. Without conservative voices who will stand firm on these values, Democrats will wind up being the real winners of this most contentious recent debt ceiling debate. As many, or depending on how one looks at it, as few as 25 Republicans are refusing to support Speaker’s John Boehner’s deficit reduction plan. A late scheduled vote on the plan on Thursday was pulled after it became clear to the House Republican leadership that they did not have the 217 votes needed to pass the Boehner plan and it is not yet known when or if the vote will take place on Friday. This leaves the Senate and House with approximately only three days to cut a deal that would allow the federal government to raise the debt ceiling before it has the potential of defaulting on its current debt on Tuesday, August 2nd. But on Thursday, financial institutions reported that based upon all of the deficit reduction plans that are being considered, no matter which one is passed, the markets are likely to downgrade the United States’ credit rating because none of the plans reduce the national debt sufficiently enough to sustain its current AAA rating. This fact has only helped to reinforce the position of the 25 or so House Republicans who have taken the position that they can support any of the plans out there, because they do not go far enough in cutting spending. Given the new data, these approximately two dozen Republicans are right. If President Obama and Democrats are to be believed, we were going to default on our debt by August 2nd, if we did not raise the debt ceiling. Aside from bogus Democrat attempts to scare senior citizens by claiming that they would then not receive their Social Security checks, the main argument for the need to raise the debt ceiling was that a failure to do so would force a downgrade of our credit rating. This would produce a significant increase on interest that all Americans would have to pay. But now that it is clear that neither Boehner’s or the Democrat’s plans would cut spending enough to avoid a downgrade of our credit rating, it only makes sense to do what is necessary to avoid that form happening. As such, the position held by the Republican who are holding out for more spending cuts and a more significant deficit reduction plan, are right to oppose the existing plans. With the facts as they are, to do anything other than come up with a bill which that significantly and quickly cuts our deficit and debt, would be meaningless. If the G.O.P. led House does now pass the Boehner plan, the only possible reason for it would be an obvious desire to avoid the political fallout from leftwing rhetoric designed to make the Republican Party look like the Party of “no” and as obstructionists unwilling to compromise. But the question is what are the compromises choices? Pass a hike in the debt ceiling by August and see our credit rating downgraded because our current debt obligations and future debt is unmanageable? Or default on our debt by not raising the debt ceiling and still see our our credit rating downgraded because our current debt obligations and future debt is unmanageable? That is not a compromise. It is insanity as described by Albert Einstein it is doing the same thing over and over again and expecting different results. . The only sincere political move here would be to hammer out a bill that cuts costs and reduces spending. Part of those spending reductions must include true entitlement reform. Entitlements are the largest portion of the existing and future debt. They are the elephant in the room and to ignore them or pretend that it is not there is not just stupid, it is lethal to our economy. As for Speaker Boehner, I appreciate the direction he has been going in. His leadership has been pushing for less spending and more cuts. However, as we can see, he was not pushing for enough cuts in spending. Under pressure from President Obama and the Democrat led Senate, he has been encouraged to compromise. In his unique position, Boehner has tried to accommodate both his conservative caucus and the liberal President and Senate. 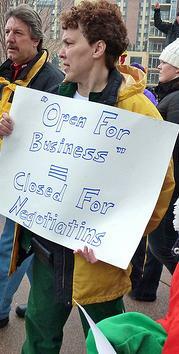 But it is clear that in this case, compromise will not save our economy or our economic future. So speaker Boehner must ask himself this. Will he act on this issue as a politician or as a leader? Currently the following 25 members are said to be voting Nay on Boehner’s bill. These men and women understand that passing the Boehner plan would be nothing more than a purely political vote and they would rather lead than play politics. Hopefully, these 25 members can influence Speaker Boehner in a way that will force him to do the same. In 2010, voters clearly and loudly called for leadership, not compromise. Much of the electorate is tired of political compromises that benefit the political careers of the political players but do great harm to the long term health of our nation. The 25 members holding out for more cuts understand this. They are also making this moment in time a pivotal one for the career of John Boehner. Boehner promised to be a different kind of Speaker of the House. He promised those who put the G.O.P. in control of the House that he would not cave in to politics-as-usual, would not forget the need for fiscal responsibility, and would uphold a commitment to accountability. Now is his chance to prove that he was not lying. Now is the time for a political leader who will stop playing games and get the job done. Right now, that job is to come up with a plan that significantly reduces our debt and does not just move numbers around. John Boehner must be brave and willing to turn the tables around on the Democrats who live in a world of perpetual taxing and spending. Instead of being on the defensive and afraid that Democrats will paint Republicans as the Party of “no”, Boehner must be brave and demonstrate how Democrats are being the Party of “no can do”, the Party that can’t propose a budget, the Party that can’t cut spending, can’t avoid a downgrading of our credit rating, can’t stimulate our economy or create jobs, and that can’t reform the entitlement programs that will go broke if they are not reformed. What it comes down to is who is the Party of “no-can-do”, and who is the Party that is willing to say no to the right things? John Boehner can make the answer to that question clear to the American people, but only if he is willing to side with those who are more concerned with solutions than they are with political perceptions. Any day now, the New Jersey State Senate will be taking up important legislation called the Market Competition and Consumer Choice Act (S2664). The measure is not a topic of discussion at Garden State dinner tables, but it is one that is worthy of fighting for . Passage of this bill would reform outdated laws that have outlived their usefulness, and hamper the development, expansion, and use of new technologies within the state’s telecommunication industry and among cable providers. The Consumer Choice Act is actually one of those rare pieces of legislation which rectifies legislative inadequacies and instead of suffocating economic development and stifling competition, it promotes competition, the drive for greater customer service, lower prices, and business expansion that creates something sorely lacking these days….. Jobs. In a day an age when the Obama Administration is causing many Americans to understand that more government and more government regulation is not necessarily a good thing, New Jersey is slowly waking up to the same reality. People like former Governor Jon Corzine helped show us that big government comes with a big price tag, a price tag that costs way more than its worth. More government and more government regulation is a rising tide that lifts all costs. From the cost of utilities and the price of merchandise and services to taxes, over-regulation delivers higher costs and less competition. And with decades and decades of intrusive federal, state, and local regulations, New Jerseyans live within a tangled web of government weaved red tape. That’s why the Consumer Choice Act is so important to New Jersey. Newly evolved technological advances in the telecommunications industry have transformed the industry, but New Jersey’s outdated laws, create an obstacle that makes it hard for the benefits of these new technological advances to fully thrive in New Jersey. Yet special interests which profit from the enforcement of oppressive regulatory policies, want to prevent the New Jersey State Senate from passing the Consumer Choice Act. Blocking it in the state senate is their last hope because the bill has already passed the State Assembly. 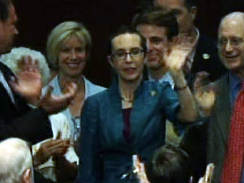 In fact, in the Assembly it passed with enthusiastic bi-partisan support. Even among the leadership of both Parties, in both legislative chambers. These special interests are literally trying to scare voters into demanding that their State Senators vote against the Consumer Choice Act. They are threatening legislators with the promise of pumping tens of thousands of dollars into campaigns to defeat them during next years state legislative elections. And to motivate voters to their side, these special interests are stooping to scare tactics and lies. They are trying to convince vulnerable, fixed income senior citizens into believing that their phone service will be taken away. They are trying to make sports enthusiasts believe that their favorite cable sports channels will evaporate right before their very eyes. The problem is, the Consumer Choice Act is anything but a danger to existing services. It promises to increase choices, enhance service quality and hold down or even reduce costs through competition. Current regulatory policies do not properly deal with the realities of the competition that exists in today’s telecommunication market. The way regulations are now, companies like Verizon are able to dominate the market and inhibit consumer choice among alternate technologies such as cable companies, and wireless and competitive local exchange companies. This in turn stymies investment, innovation and growth of the telecommunication industry and among cable service providers. That lack of growth is costing New Jersey desperately needed tax revenue ….. increased tax revenue that could come without raising taxes. This has been proven in other states which have adopted legislation similar to the Consumer Choice Act. When Indiana adopted such reform legislation, they saw an influx of investment from telecommunication companies that approached half a billion dollars and created thousands of new jobs. But here in New Jersey, we are left to contend with outdated legislation that stifles competition, kills growth, inhibits innovation and discourages employment opportunities. Well it is a new day in New Jersey. With Governor Christie at the helm, you might say that it’s finally morning in New Jersey. As such, we now have an environment conducive to getting government out of the business of bureaucracy, untangling the red tape that creates a hostile environment for business and industry, and can reform government in a way that will allow it to enter the new decade that has already begun. The Consumer Choice Act does that. It is a reform that allows government to catch up to the times. And at the same time, people need not fear the cries of wolf coming from the special interests opposing this bill. Existing legislation such as the Consumer Protection Act , helps insure consumers against all the evils they try to scare us with. We live in a state that has an innumerable amount of antiquated and truly stupid laws on the books. Take the Married Women’s Property Act from the 1800‘s. It allows only married women to own, control and dispose of property. Then there is another law still on the books from the 1800’s. It claims that if a woman is raped but then gets married within a certain timeframe, the man can’t be considered a criminal. State Senator Jennifer Beck is trying to get these laws repealed. But there are hundreds of senseless and outdated laws still on the books. One of my favorite state laws makes it illegal for men to knit during fishing season. On the local level, in Newark there is an existing law that makes it illegal to buy an ice cream cone after 6pm without a note from your doctor. How’s that for over-regulation? Let’s face it folks, New Jersey does not have a problem with too little regulation. The problem is we have too much and much of it is too old to be effective in the 21st century. That is why it’s time to pass the Consumer Choice Act. It’s time for New Jersey to step out from the shadow of our past and into the brightness of the future. And it’s time for the naysayers to take a deep breath and get on the bandwagon before they get run over by it in the 2011 elections. Call your State Senator and tell them you want market competition and consumer choice in New Jersey. Tell them you want S2664. To find your state Senator and their contact information visit the legislative directory link provided here and click on your municipality. Okay, now that Wisconsin Governor Scott Walker has framed the debate which surrounds his budget repair bill which seeks to require civil servants to give a little support to their own benefit packages and to reform the broken collective bargaining process, it’s time to take a good look at those who are in to their second week of protesting such moves. I have always enjoyed comparing the environment in which the left right protest in. For the record, I have been a protestor myself. My most recent ones were with TEA Party movement members in Washington, D.C. In those admittedly right wing demonstrations, the atmosphere was friendly and safe. Women could even their purses unattended on the Capitol lawn without fear of theft. And upon leaving, the Washington Mall was cleaner than when we got there. The same can not be said of left leaning protests and protestors. Those kind of activists tend to be full of disrespect, manners and to a large degree, focus and intelligence. Think I’m wrong? Let’s take a look at some of what makes up the crowds at the recent demonstrations in Madison, Wisconsin. They range from all works of life but are mainly comprised of civil servants, teachers, and unions member shipped in from as far away as Nevada and New Jersey. (Left)This one clears things up. Doesn’t it? (Right) This one reads “If Tea baggers are as hot as their Fox News anchors, than I’m here for the Gangbang” ……Isn’t that a peacefully classy and on the point sign? Then there are those priceless ones that make you wonder if you can conduct any kind of intelligent dialogue with some of these buffoons. 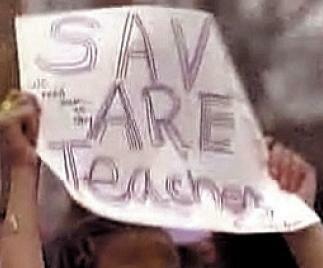 Keep in mind, many of these people are striking teachers. 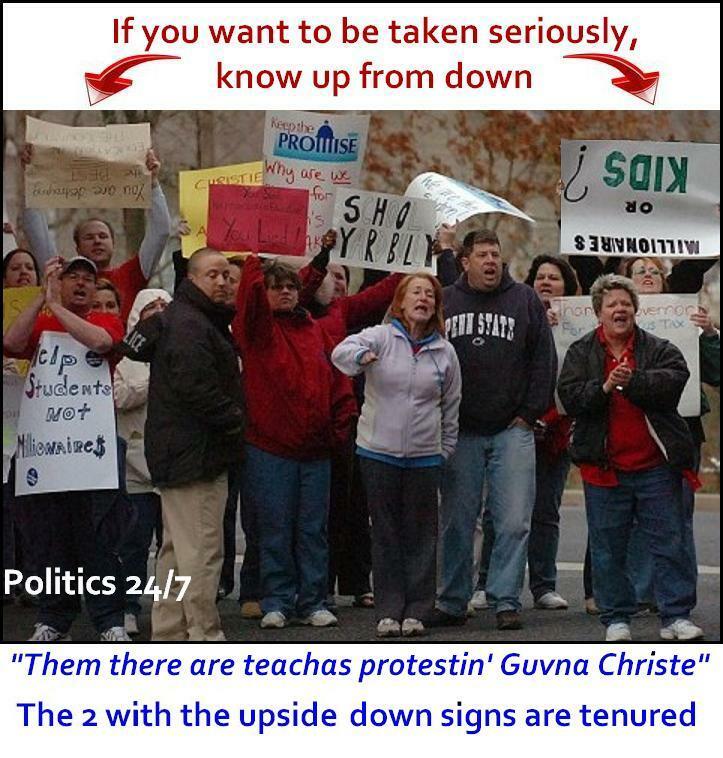 After seeing some of these signs, I think the what they really achieved through these recent protests is to prove that we must end the practice of giving teachers tenure……. (Far Right) This one must have found the “our” that the other sign was looking for because she has it where the other one needs it. 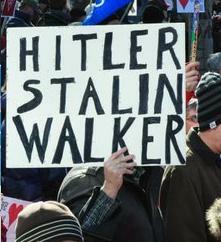 (Above Right) These people were too embarrassed to keep marching with their pretty sign. After all their work and design time someone broke their little union hearts and must have told them that they meant to write they are the future and that they “need” quality teachers, not “neen” them. (Right) Now there is nothing wrong with this sign but it and the picture of it say a great deal. 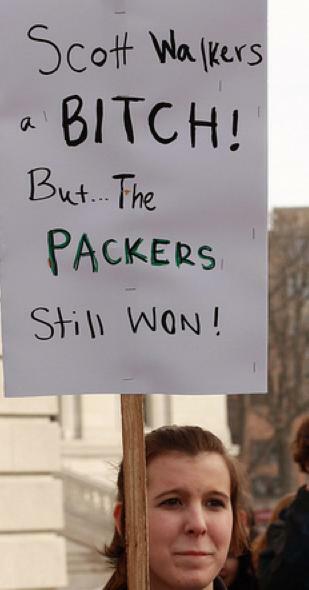 Many of the teachers in Wisconsin went on a little strike by calling out sick. Some of them showed up at the protests. 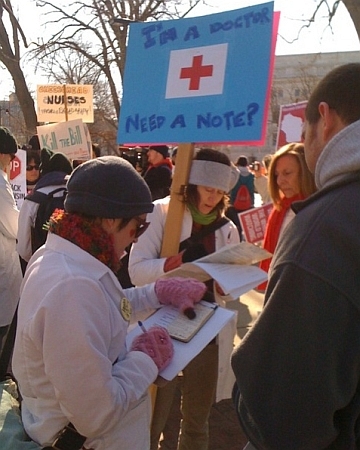 Here are a group of doctors who are issuing them doctor’s notes for their absence. Problem is that such an abuse of such notes is against the law and according to National Medical association, could cost those doctors who issue those notes improperly, to encounter serious suspensions of their licenses to practice medicine. All in all, it looks to me that while these folks are making a lot of noise, they are not making a lot of sense. 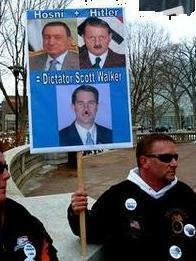 That’s why I am prepared to listen to Governor Walker a lot more than them. 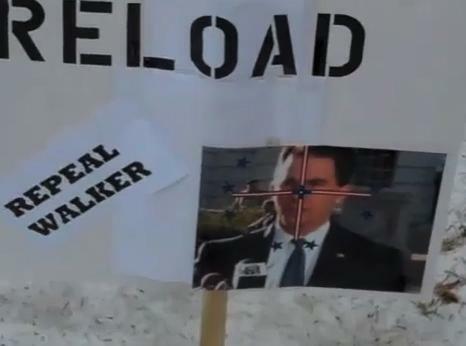 Governor Walker was they guy elected to do what he is doing, not the sign makers and law breakers we see pictured here. As cold and snowy Wisconsin heats up due to newly elected Republican Governor Scott Walker’s attempt to get his states fiscal house order by daring to ask that union workers contribute to their own benefits, as a New Jersey Republican I thought it appropriate for the Garden State to send the Badger State a some advice and a little pick-me-up. It has taken New Jersey more than a decade of a Democrat controlled state legislature and Democrat Governors, some corrupt and some not quite as corrupt, to finally elect someone with the nerve to stand up to those who have had their hands out and in the taxpayers pockets. And as soon as Governor Christie told them that the party was over, they screamed and hollered and some teacher union leaders even publicly called for his death. But Governor Christie is still standing and he does so with many New Jerseyans firmly behind him. So my advice to all you Wisconsin voters who would rather see a union worker red with anger than your state drowning in red ink, stay firm and stand behind your Governor. 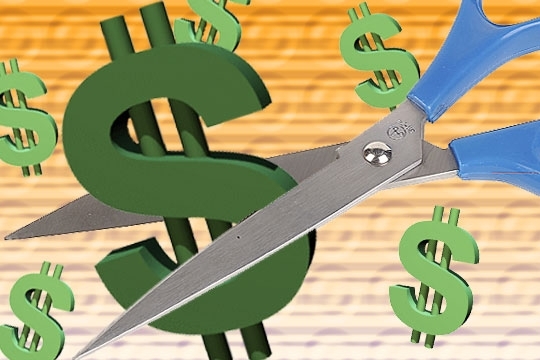 Write letters to your newspaper editors, call in to your state representatives and send an email letting them and Governor Walker know your for the cuts. And take a lesson from New Jersey. Just because bus loads of SEIU and AFSCME and NEA members from out of state show up at your state capitol, it doesn’t mean that they are representative of your states citizenry. You elected your representatives. It just means that union dues and big labor are still hard work trying to nickel and dime taxpayers. Not more than a few months ago, hundreds of similar bus loads crammed in to Trenton to protest Governor Christie the same way they are now with Governor Walker. But in the end, after all the screaming and yelling, after all the fist pumping and sign waving, voters know that 2 plus 2 equals 4 and that what these big union lobbyists are telling us, just doesn’t add up. 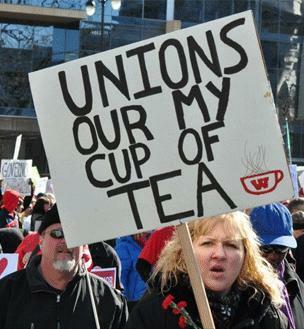 The picture below was taken at one of those union protests in Trenton and it gives me an idea. 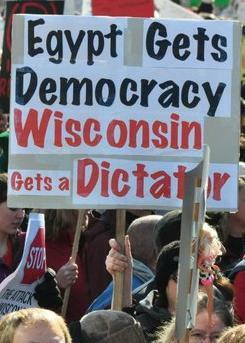 What do you say you in Wisconsin keep monitoring your protestors and we in New Jersey will do the same? Take pictures, videos or just write down your favorite union protestor tale. And let’s see which state has the most ridiculous ones. I’m sure it will be a close contest. After all, many of the protestors there are the same ones we have had here. In what can only be viewed as a sign of things to come, the Democratic National Committee is returning to their attempts at demonizing Republicans by trying to paint their conservative base as heartless fiends and maniacal evil scientists who would dare to experiment with such things as the ability for the free market to improve quality and life in America. In a video put out this week by the DNC, clips from CPAC, the American Conservative Union’s annual Conservative Political Action Conference. What the ad does not tell you is that for Democrats, those big things are big government and big government programs which replace the American entrepreneurial spirit with bureaucratic mandates and regulations that have a return on the dollar that is less than the cost required to implement. Another interesting thing to point out is that, the way I see it, the DNC seems to also be banking on President Obama’s supposed great oratory skills as means to appeal to the hearts and minds of the American voter. Not that there is anything wrong with that. A President should be able to do so, but one must be able to tap into American sentiments if they wish to be successful at such attempts. One must be Reaganesque if they wish to do that. The problem is we knew Ronald Reagan and Barack Obama is no Ronald Reagan. Nice try though. As Goes Texas, So Goes the Nation? The census numbers for heavily Republican Texas have come in and while the state’s anticipated population growth was going to pick up as many as 4 new Congressional districts, Republicans can’t necessarily count on these seats being Republican districts. For the first time in contemporary history Texas now has a majority of minorities in its population. Conventional thinking is that this will soon turn a heavily red state blue or at least turn it into a swing state and give Democrats a lead in 3 of the 4 most populous states in the nation. But a look at a few statistics gives Republicans cause for hope. Texas Republicans seem to be better at appealing to Hispanic voters, the fastest growing minority population, than do most other State Republican Parties. G.W. Bush received nearly 40% of the Hispanic Vote when he ran for Governor and incumbent Governor Rick Perry garnered 38% of the same vote in his last election. These numbers are huge when compared to the typical national average for Republicans. But more than that, in 2010, incumbent Republican Congressman Blake Farenthold was able to maintain his seat in a majority Hispanic district and two of the newest Republican freshmen in Congress who come from Texas are Hispanic …….Bill Flores and Quico Canseco. Additional good news is that many Hispanic Democrats who are elected to the Texas state legislature are conservative and some have defected to the G.O.P. In the meantime, while Texas’s new majority-minority population status and overall increased population creates 4 new Congressional Districts and electoral votes for the state, all the above factors upend the conventional thinking that they will be quickly occupied by Democrats. Indeed it is likely that 2 new majority-minority districts will be created, but it is not a foregone conclusion that they will elect Democrats. The culture of Texas and make up of its population has a great part in this. Texas is indeed the Lone State and that spirit of independence runs through the Texas culture probably more so than most other states. But Hispanics in Texas tend to spread out through the state and live in more rural and suburban neighborhoods than do their counterparts in places like New York and California where they tend to be concentrated in urban centers. The rural versus urban culture plays heavily in to voting patterns. People who live in more rural settings where services are far and far and few between, tend to vote more conservatively than do those in the big city/big government regions of the nation. But that factor is not the sole reason for Republicans being much more competitive among Hispanics in Texas than most other states. The Texas G.O.P. does not ignore Hispanic voters. It focuses on them. It even recruits Hispanic leaders to run for office on the local levels, sort of like a baseball farm team for higher offices. So while the fact that Texas has now become a minority-majority population should initially scare the bejeezus out of Republicans by signaling the possibility of becoming the next California and New York-like Democrat stronghold, such is not the case. The only real case here is for the G.O.P to apply the Texas approach to Hispanic voters on a national level. The concept is not impossible. After all, look at Texas’ heavily Democratic neighbor New Mexico. It just elected a Republican Governor, a Hispanic Republican, woman, governor, the strong and feisty Susana Martinez.